Schuler Inc., Canton, MI, reports that data from a recent customer shows that laser cut-to-blank machines with the company’s DynamicFlow technology can match the productivity of conventional cutting lines. According to company officials, after the first year of operation, the new plant exceeded the contractually agreed output rates by 20 to 100 percent, depending on the component produced. 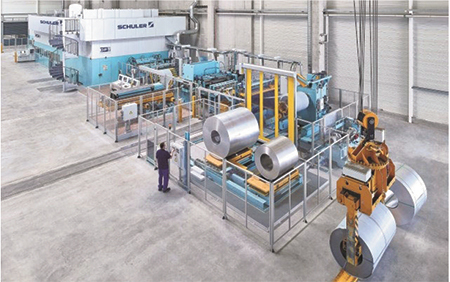 For example, more than 8500 skin panels were produced in one shift via laser cut-to-blank machines, enough to supply a Schuler servo-press line operating at 18 strokes/min. Especially with surface-sensitive aluminum circuit boards, the laser-blanking system rivals the productivity of a conventional cutting line, claim company officials. In addition, the customer reportedly saves on the purchase, storage, maintenance and repair of tools, as well as set-up effort due to the fact that blank shapes can be changed at the push of a button. Laser cutting also improves cut-edge quality. Several laser-blanking machines with DynamicFlow technology already are in operation in the automotive industry.